Few things fuel the imagination quite like the idea of an all-out zombie apocalypse. Everyone has thought about it, at least in passing. Odds are, you could ask the next 10 people you meet what their zombie apocalypse plan is- and they’d have a thought-out and prepared answer before you could finish the question. The question for you is, do you have what it takes to survive the ultimate zombie outbreak? If not, here are a few pointers that just might very well keep you alive when the dead refuse to stay down. This is just a no-brainer (no pun intended- we all know zombies eat everything, not just the brains.) Preparation is the key to survival in any situation, zombies are no exception. The first thing you need is a good bug out bag, or BOB; this is your lifeline in the case of emergency. The great thing about BOBs is that they are useful for any emergency; natural disasters, catastrophes or worse. So this one just goes without saying, you need to put your bug out bag together. There are lots of sources online to help you build the bag that is perfect for you; however, the general rule is that bag should be able to keep you alive for a minimum of 72 hours. So, in planning your bug out bag you need to consider what you would need if you had to survive for 72 hours without the luxuries of home. It goes without saying that you need to cover food and water, but you also need to think outside the box. Sure, you need a first aid kit, matches and a knife at minimum- but what else? A few things to consider are items like medicine, personal security, a map and compass as well as a handkerchief or shemagh- the true multi-taskers of the prepping world. Keep this bag handy and easily accessible at all times, either in a discreet location near the door or in your car- better yet, both. The fantasy is that you alone take on the dangers and ravages of the world, staying alive against the odds. Reality check, that doesn’t usually happen. Your odds of survival are greatly improved when you travel in a group. Not only do you have others to watch your back and carry extra gear, the simple presence of other people around that you know and trust is a huge boost to morale. Sadly, it isn’t very likely that the zombie apocalypse will occur during the middle of poker night with your band of survival brothers. Having a designated meeting place for your fellow survivors makes the odds of making it out together much higher. Choose a point that is feasible to meet at in a relatively short amount of time. This means keeping the distance fairly minimal, but away from main highways and hubs of transportation. Remember the poster for the “Walking Dead”? All of the cars trying to leave Atlanta, every single one of them jammed up in complete gridlock. That gridlock is the reality- within hours of any kind of catastrophe there will be a mass exodus from every major urban center. Be ahead of the crowd and plan your route ahead of time to a more isolated position so that your group can meet and quickly get to less populated areas. The roads will be packed with people in gridlock, just lined up to become the first pass in a global zombie buffet. However, they have the right idea. Heavily populated areas are an absolute death trap in this kind of catastrophe. First, they will be the immediate targets; obviously the more populated areas provide larger zombie food pantries- this is where they will migrate. Second, again within hours, most locations will have been stripped of any useful supplies and food. 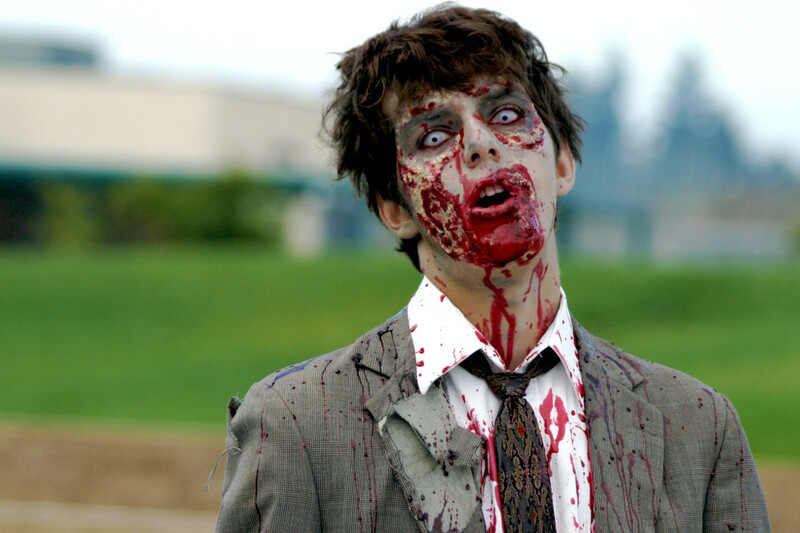 Without any supplies to collect and with a greater zombie density, urban areas quickly become the worst places to be. As well as planning a place to meet your fellow survivors, you need a place to go. This doesn’t have to be a secret fortress floating somewhere over a swamp in the Everglades- that spots already been taken by Lex Luthor and the Legion of Doom. Nor do you have to have a tricked out bunker buried underground; of course- if you do, that’s a great start. Your destination can be simple; perhaps it’s a farmhouse that belongs to someone in the group or even a small tract of land. As long as it is away from populated areas and off the beaten path, you stand a greater chance of staying alive. Maybe you were asleep, maybe you didn’t believe the reports or maybe it just happened so fast that you didn’t have the chance to get out in time. Worse yet, maybe you are one of the ones who didn’t plan at all. There is still hope for your survival, but only if you keep a survivor’s mentality and approach everything as a solvable problem. Even if you think the idea of a bug out bag is a little extreme, consider making sure that at the very least your home can support you for up to 72 hours- the longer the better. It seems an obvious idea, and you probably figure you are golden now. However, statistics show that a staggering number of people don’t have food for 72 hours, or a single first aid kit; much less plans for collecting water or tools. An entire article could be written just on preparing your home, and what to do there in case of catastrophe. For the sake of the zombie apocalypse we will just focus on a few things that you can do to survive. Secure your home: Lock the doors and windows and secure them however you can. That means barricade the doors and use sturdy items to brace the windows shut. Lock it down, and board up whatever you can if you have the means and time. In order to not draw attention to you being inside what might look like a cozy haven, use heavy blankets or paint to cover windows. This way, you will keep movement and light blocked from the view of the hungry masses. Secure your water: As soon as you know the business is hitting the fan, turn on every faucet and bathtub in your home and fill everything you can find with water. When that is done, fill the sinks and bathtubs- water is survival and every drop counts. In a major event such as the rise of the dead, it will take a matter of hours for water pressure to be lost and for your faucet to become as useful a water source as your home entertainment system. Secure your food: You need water sooner and more urgently than food, however food has to be considered too. As soon as you have collected as much water as possible you need to inventory your food and, if necessary, be prepared to ration. Always eat the perishables first, this should go without saying. Secure the gear: Next you should be thinking about what you have in your home that may help you out. Think of things like blankets, pillows, tools, batteries, lights, etc. Secure your escape: Odds are, your 3rd story walk up isn’t going to be your forever home for the rest of the apocalypse, so you need to be planning the next step. With everything in your home inventoried; prepare essential items for transportation in sturdy backpacks that you can grab at a moment’s notice. That’s right, we’re back to the bug out bag; don’t you wish you had one before? Keeping these bags ready means you can leave at a moment’s notice- whether it is an opening for safe escape, or your location being overrun. Preparing for the dead to rise is one of the best ways to prepare for any type of catastrophe. Believe it or not, you will wind up preparing for most every kind of situation that might leave you on your own to survive. You have to be prepared to be mobile, as well as locked down in a location- and you must have primary and secondary plans set up. In fact, the CDC has used the zombie outbreak scenario as a training exercise for years now. So just remember, if you are prepared to survive the zombie apocalypse- you are prepared for anything.